Still, I suppose I'm one of those people that likes garlic TOO MUCH. I have to admit that sometimes I get self conscious of holding a conversation after having a garlicky meal. That’s why I brush my teeth religiously and always carry with me a pack of Altoids or Tic-tacs. And when I feel like I had waaaay too much garlic, I go for a long run (or bike ride) and sweat it out. I don’t know how scientific this is, but it works every single time -> break a sweat and no more garlic smell/odor on you, I promise. One thing I wanna do one day, is go to the Gilroy Garlic Festival in northern Cali. If you like garlic as much as I do, you’re going to love these Garlic Butter Zoodles with Herbs. They’re buttery and garlicky and full of green goodness and so delicious. It’s like green stuff over green noodles in a rich and super-flavorful sauce. I used zoodles because you know, I’m into that stuff. But you can use regular spaghetti or linguini or you could eat the sauce by the spoonful. It’s greens sauteed in garlic butter, you know, kind of amazing. All in all, this is a yummy, quick, and easy meal that will win raves in your house. Unless you’re a vampire, then you’re pretty much on your own. Garlic Butter Zoodles with Herbs Print this recipe! 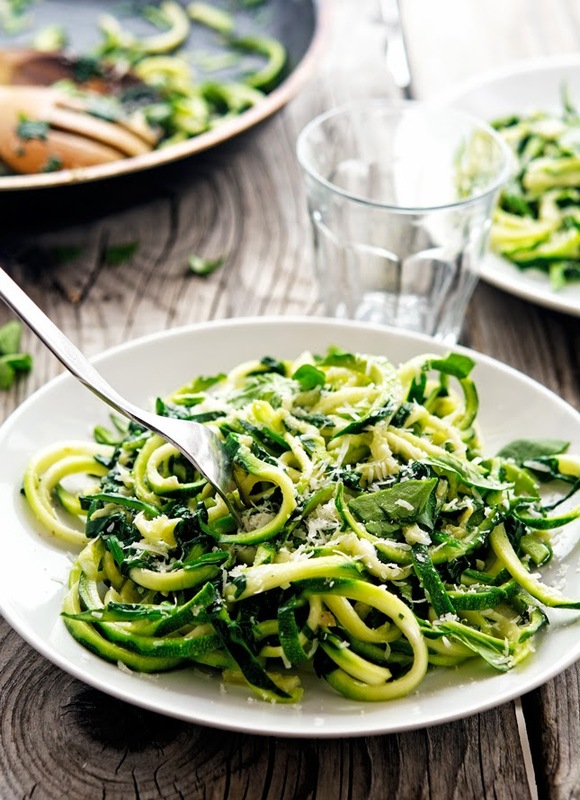 Using a spiralizer or a peeler create zucchini spaghetti (always read the directions for your spiralizer as they vary by brand - I use this spiralizer.) 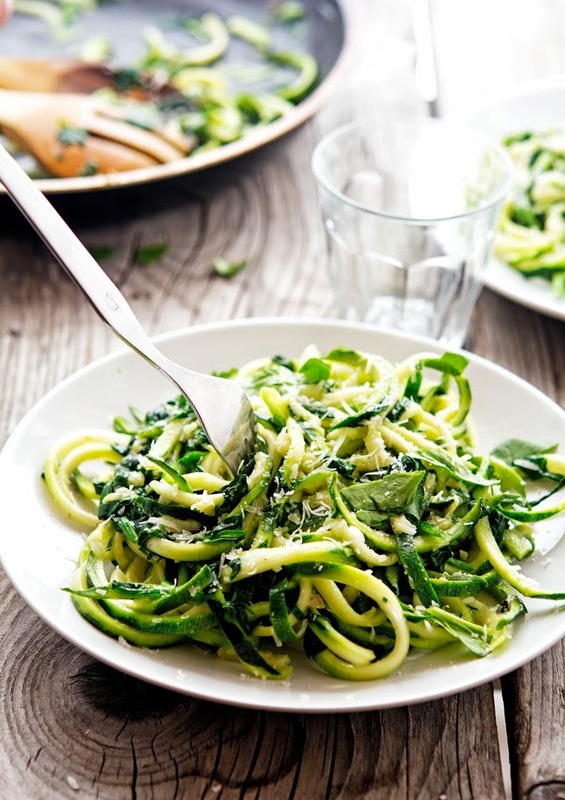 If you don't have a spiralizer use a regular vegetable peeler to vertically peel long, thin strips of the zucchini. This will form more of a wider "noodle" from the zucchini, like fettuccini. Heat one tablespoon of butter in a large skillet over medium-high heat. 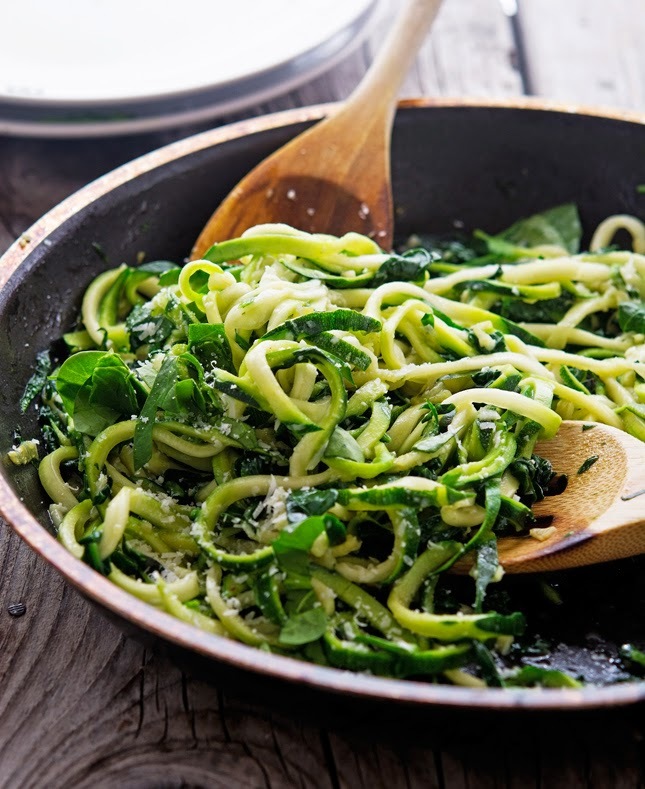 Once hot, add zucchini noodles and cook for about 2 to 3 minutes, until zucchini noodles are tender but still retain some crunch. Wipe the pan and melt the remaining tablespoons of butter over low heat. Add minced garlic and saute’ for about 5 minutes, until fragrant. Keep an eye on the garlic the whole time, you don’t want it to brown or it will turn bitter (use the smallest burner you have if necessary). Add chopped basil and spinach to the skillet and stir until wilted about 1 minute. Turn the heat to medium-high, add zoodles and saute’ for 2 minutes, stirring constantly until heated through. Season with salt and pepper, sprinkle with grated Parmesan cheese and serve. One serving yields 262 calories, 19 grams of fat, 19 grams of carbs, and 9 grams of protein. I think I am going to try this one! :) I love garlic and this recipe seems to be so delicious! No such this as liking garlic too much! I often put double the recommended amount if I'm following somebody else's recipe! Ditto Cate, garlic is hands down the best! 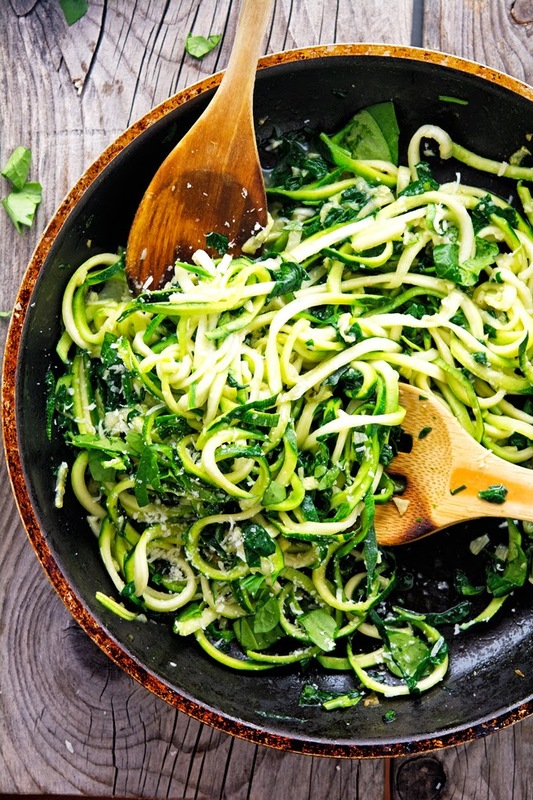 Zoodles are > than spaghetti in my books too, but garlicky zoodles are > than zoodles ANYDAY!!! Hope you have a wonderful weekend, Mike! I'm so convinced that you can sweat spices/herbs out, it works every single time! This one looks mighty grubbin' and I for one LOVE garlic. Great photos, too Mike. Whenever I drive up to San Francisco or coming back down to San Diego you always know you're near and going through Gilroy... because you can smell it for miles. GARLIC capital! Have never been to the festival though. Maybe one of these days. Have a great weekend. You really can smell it from miles? That must be awesome! Dude, seriously, when is your book coming out. Once again, you nailed it. This looks amazing! I'm a massive garlic fan too. Practically everything I make includes garlic, it just makes everything better! Yum I love all these ingredients! So true Lauren, garlic makes everything better! Garlic ICE CREAM?? I'm curious!! Looks awesome, Mike. Happy Friday!! Garlic is the reason why so many of my favourite meals taste so good- I've even gone to lengths to make 'faux' garlic bread to get my fix. 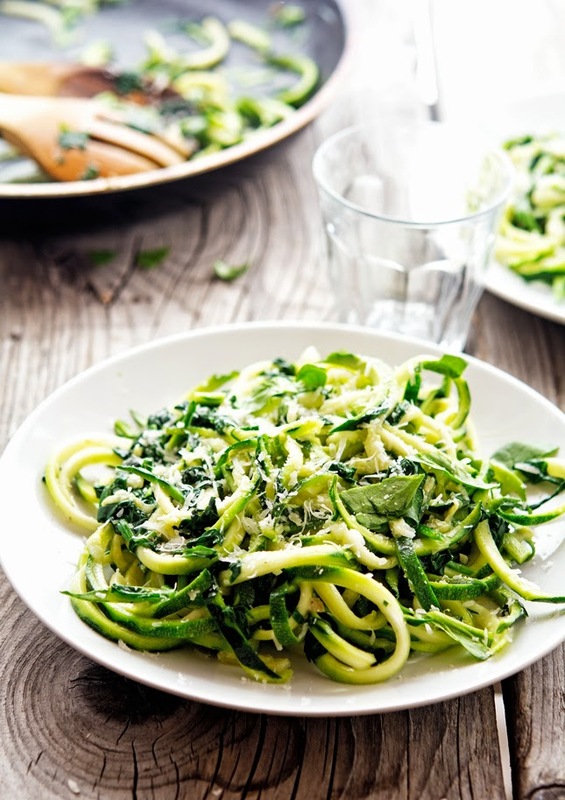 This looks delicious and once again, you make me want to buy a spiralizer! Okay man you need to buy yourself a spiralizer. It's non-negotiable anymore. Alright? This looks so delicious Mike, love garlic! I'm a massive garlic fan too.. I usually roast bulbs whole and eat them with cheese, crackers & red wine (much to the dismay of others). I definitely would love these garlic butter zoodles then.. another awesome creation Mike! Roasted garlic spread onto crackers is to die for, I'm definitely with you on this one T! "I’m the kind of person who’s terribly suspicious of people that don’t like garlic"
Garlic and butter is a marriage made in heaven. No kidding! Did you just say GILROY garlic festival?....I'm jumping here....Let's plan it sometime. Omg, I love love going to the festival. We stay an hour from Gilroy. The icecream(which I'm not fond of), the garlic chicken, garlic popcorn...so many things we can try. Well, anyways I love garlic and this dish. I would eat zoodles only if it's dunked in garlicky sauce like this. You lucky lucky girl, I envy you so much from living one hour from Gilroy. I'm a bit disappointed that you're not fond of the ice-cream. Is it really bad? Garlic butter on everything.... always! I agree with you on the mistrust thing, how can you not like garlic, or onions for that matter? Exactly Kari, onions and garlic are meant to be loved! Dude, did you know that there is a garlic festival right here on Long Island every year? I think it's at the Garden of Eve farm out in Suffolk. Just google it and I'm sure you'll find it. I think they have garlic ice cream there and everything... although I can't blame you for wanting to go to Cali! Wait, what? A garlic festival in Suffolk? I'm going to google it right away. Thanks for the tip man! Very good ... added grape tomatoes that added color/flovor and pinch of red pepper flakes ... making again tonight ... great summer dish on a rainy night. That's awesome Joey, I'm so glad you liked it! Wow. Can imagine this bursting with flavour. I'm in ketosis. This is absolutely perfect. It's a must make for me. Thanks. This was delicious! Didn't even taste remotely healthy. Made it on the weekend and took it to work for lunch today. Thanks Mike! This sounds so good will have to try asap. Tks. I made this tonight and we love it!!! Just amazing. I didn’t have the parsley but we did sprinkle the Parmesan on it and some pecan chips. Thank you for this great recipe.